Open year-round. All Amenities, just like home! 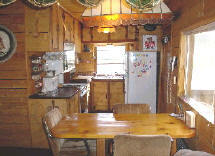 Fully furnished Chalet in ever detail down to the spices. Living room has wonderful view of the riverfront. 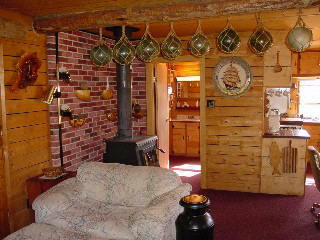 Truly Alaskan decor with glass fishing floats, moose antlers, trout, local wood work, sofa, loveseat, recliner, sound system, VCR, Satellite-TV, phone, dining room, outdoor Gazebo dinning, gas heat and wood stove with dry cut wood. 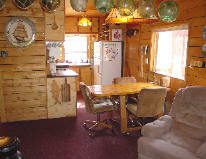 Outside amenities include fish cleaning, freezing, and smoking facilities. 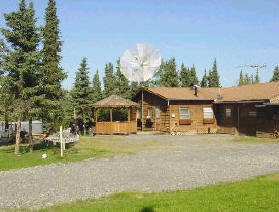 The preferred choice for travelers to Soldotna or Sterling looking for a peaceful quiet scenic cabin, home, or lodging. Sundance Maxxus Spa overlooking the river. Perfectly kept kitchen, dining table, fridge, freezer, double ovens, microwave, coffee maker & grinder, blender, deep fryer, cookware, all tableware, and dry goods. 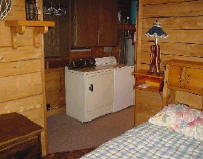 Washer & Dryer, ironing board, iron, towels, linens, hair dryer, robes and sandals. 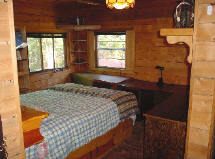 Bedroom has queen bed and walk in closet..
Full bath with tub and shower, vanity, soaps, and paper supplies. 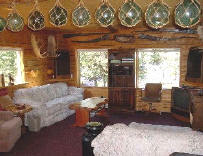 Click here for rates Chalet Summer (June 1 - Sept. 30) BOOK ONLINE!